Why spend money on coverage that costs a fortune, when you may qualify for a plan with the same benefits at a lower price? Our free Medicare plan checkup will do exactly that – find you the most affordable coverage! 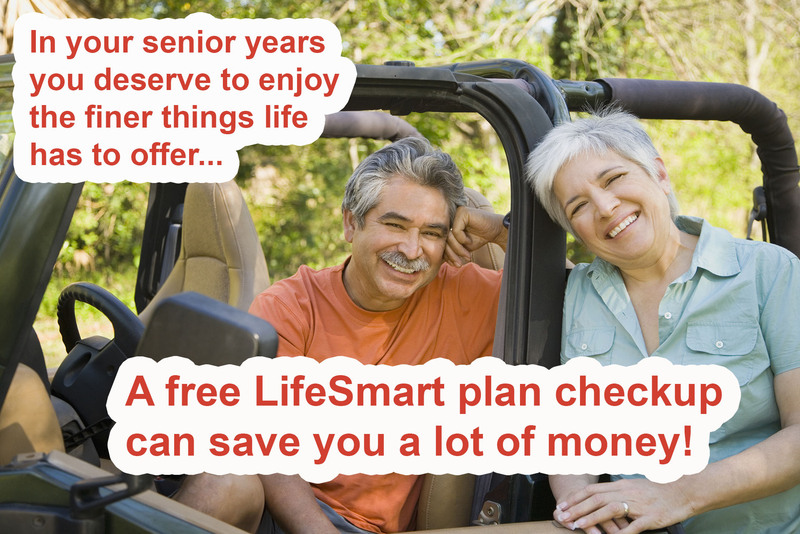 At LifeSmart we have helped thousands of seniors save money so that they can enjoy the lifestyle they deserve – with peace-of-mind knowing that you have the best coverage for your circumstances. Do you have any questions about your current coverage? We are independent agents and we work with all the major carriers – we will give you a non biased evaluation. Are you paying too much for you current Medicare Supplement? You may qualify for a plan with the same benefits at a lower price. Medicare Advantage and Medicare Part D plans are offered annually. Do you have question about the changes to your current coverage? Are all your drugs covered by your current plan? Will they be covered next year? You need to review your drug plan annually or it could cost you thousands of dollars. Does your current plan cover dental, vision or hearing? Are you eligible for extra help? We will help you find all the benefits you are eligible for. Are you concerned about your current plans co-pays? We can show you how to cover them. Don't hesitate - it's never too late to save money on your Medicare costs! Call a LifeSmart advocate today for your plan checkup! For Your FREE Plan Checkup!